Monday was a very busy day. 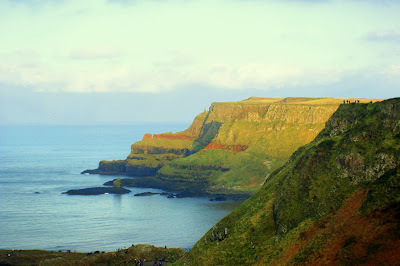 We toured the north part of the Coast Road seeing the some little port towns, Dunluce Castle, and Giant's Causeway. 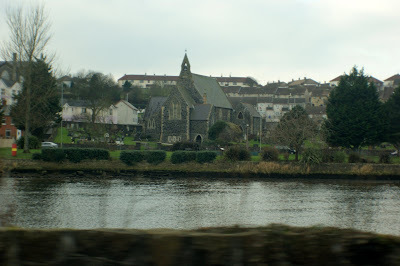 We started along the River Bann (the longest river in Northern Ireland) which flows through Coleraine, and into the Atlantic Ocean. It is a beautiful river with the city built up on both sides. 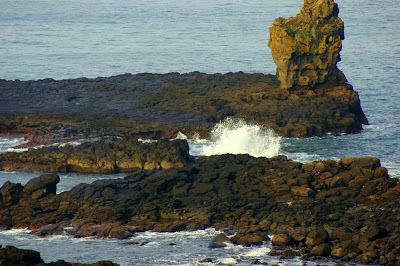 Just north of Coleraine a few miles is the town of Port Stewart. 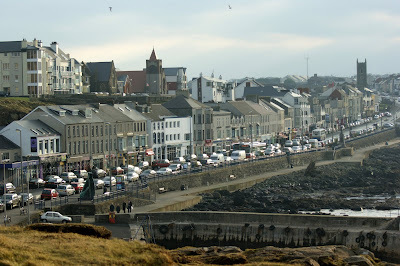 It is a beautiful little coast town with a beach called the Port Stewart Strand. Our travel guide, Mark, tells us that Adam Clark had a near-drowning experience here when God marked him for ministry. Mark and De like to take early morning walks along this beach. 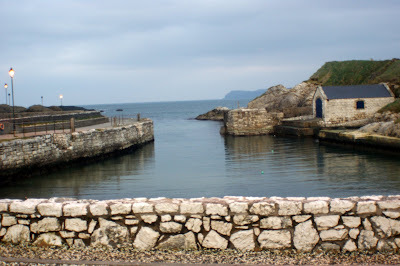 Just a few mile from Port Stewart is another town called Port Rush. 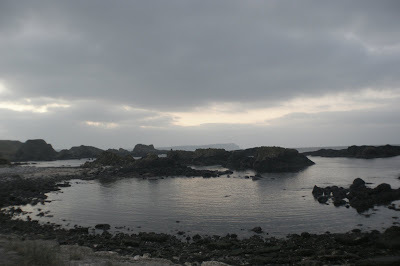 The call Coleraine, Port Stewart and Port Rush the Triangle. It is just about four miles between each of the towns. 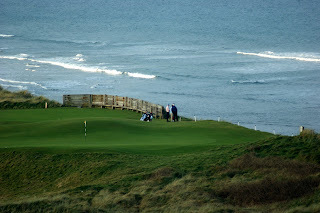 Especially during the warmer months Port Rush is a major tourist attraction. The Adam Clarke Memorial Church is located in Port Rush. Mark's church owns a little chapel just across the street on the beach (right next to the surfer's club). It's an amazing location. 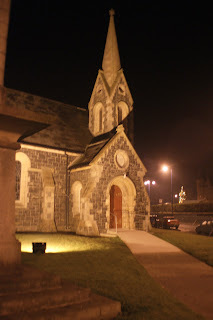 They have service there on Sunday evenings following their service in Coleraine. 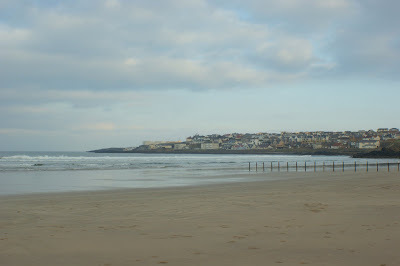 During the week the chapel is used as a book store and coffee shop where free drinks and snacks are given to the surfers and anyone wandering along the beach. 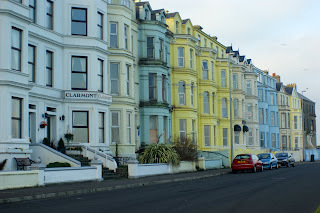 There are so many beautiful row houses in Port Rush. It kind of reminds us of the Painted Ladies in San Francisco. Actually, everywhere we went there is lots of color--houses, doors, clothes, peoples' hair, etc. 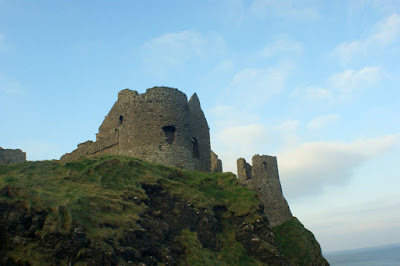 Dunluce is a 13th century castle just outside of Port Rush. Even on a cloudy day (the sun did shine later), the castle is very photogenic. 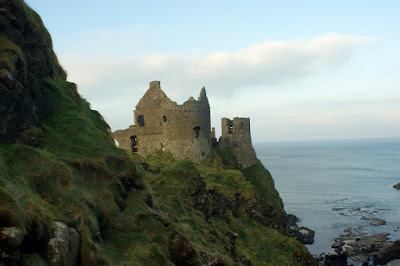 Dunluce Castle was probably our favorite castle. It is just a few miles from Mark and De's house. It is built right on the cliffs, so close that at some time the kitchen fell off into the ocean 150 feet (that's a guess) below! Here is a model of the original so you can get an idea. The castle is very well taken care of and is less commercialized than Carricksfergus Castle which we visited later. 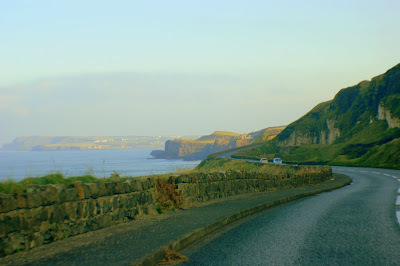 Further down the Coast Road is one of Ireland's biggest tourist attractions. You'll see why but I'm not sure the pictures can really capture the grandness of the sight. Since so many people were on Christmas break, the crowds got in the way of what would have been some fantastic pictures. This sign does not tell the whole story. The path was also very slick with muddy spots along the path. David slipped a couple of times near the edge of the cliff which had no rails! The paths were quite narrow. There are areas where the path had been wiped out by mudslides (or rockslides). The sun came out beautifully for a few pictures. 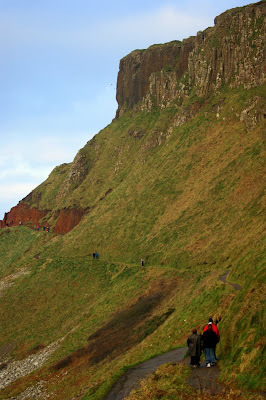 Notice the people standing on top of the ledge - that will give you an idea of how high the cliffs are. 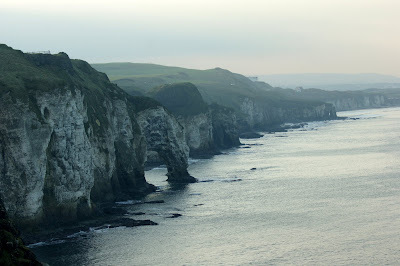 Also notice how grass grows down the cliff! The grass is amazingly hearty. We spent what daylight we had left at the Causeway. 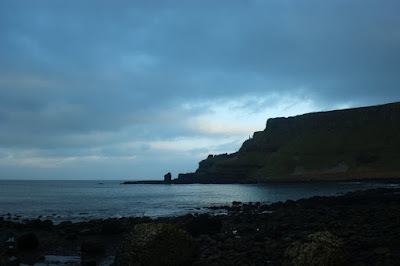 Northern Ireland is so far north that it gets dark at 4:30 or so. This area was very crowded. This picture is not great - David had the camera set for trying to get a picture of some bird so it is a bit blurry. 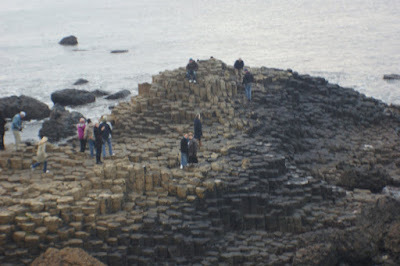 But it shows how the rocks seem to be stacked. You can literally climb them like steps. It is quite a phenomenon of nature. The ocean was fairly calm but every once in a while a wave would crash in. Living in Indiana we are suckers for a little wave here or there. and here is the view opposite the harbor. 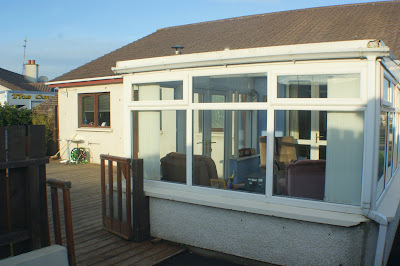 We went home, drank some tea, ate some chocolate, and watched Guineveve (a hilarious old video) in De's sun room or conservatory (depending on where you're from I suppose). There is an airline which flys from Belfast to England for very cheap fares. The siblings went together and got us tickets for our Christmas gift. Rise from a restless sleep at 3:45 am! Crashed into bed after being up for over 20 hours! The wife has been on my case to get the Christmas lights up early this year.They are up now and for some reason she will not talk to me. I owe you all a humongous apology for getting you all excited and worked up about my happy thing and then leaving you hanging in utter suspense for weeks on end. My happy thing was that my disc drive, which I've been desperate for, was fixed by following my brilliant friend Nelda's advice to plug it into its own power source. I was elated. And I made it through one senior pictures disc-making before it started freezing up my computer. So now I'm frustrated again. Pro*Byte can't even figure out what's wrong. I have some other things to try before I give up and bash the thing with a sledge hammer. If you're one of the many waiting for pictures from me I apologize profusely. I feel like I'm dragging myself around from room to room, then I wander around the room trying to figure out what in the world I'm doing there and where to start! I'm not complaining or asking for any type of sympathy, mind you. Just talking girl talk. Telling you where I am. Thankfully, so far this time pregnancy has hit me more in the tired category instead of the tears category. But then again, maybe I'd rather be busy and sobbing than happy and sleeping. Huh. Now THAT sentence didn't make a lick of sense. I'm literally sitting here laughing out loud at myself. That's not exactly how I meant it to sound. I just love nesting. It's like a giant race to your due date and you have just so many months to get your entire life organized before the screaming, pooping lizard pops into your world and deprives you of nutrition and sleep while bringing utter joy and satisfaction. I think late pregnancy might be my most productive times of my whole life. I've had.....well....3....of them. (Doesn't sound like I lead a very productive live, huh?) That's why I have to keep having a baby every two or three years - to keep this place reasonably orgainzed! I remember with one baby when my nesting whirlwind reached and linen closet, I didn't stop at decluttering and organizing it. I labeled the shelves..."King sheets" "Table cloths" "Napkins" "Pillow Cases"
Trust me, it was out of control. But really cool, nonetheless. The only kind of nesting I'm doing right now is scooping the laundry into one big giant nest on the floor so that I can drag my listless frame into bed. So for now, I'll get back to my anti-nausea Ginger Ale guzzling and leave you to ponder these deep and glorious thoughts. Well....it WAS a happy thing I just posted about, but stinkin'-nasty blogger went and LOST THE WHOLE THING! Happy Sarah is now going to bed. You'll just have to wait for the happy thing. Drive with kids, presents & Grandma from Cincy to Indy. Drop Grandma Parsons off at the airport. Watch her until she gets her bags checked and goes inside. Marvel at an amazing woman. Almost run out of gas. Take the wrong exit. Pray our way to the gas station with 5 miles left to empty. Thank the Lord for a Krogers with gas tanks. Search unsuccessfully for Ginger Ale for my pregnant tummy. Almost Fill the van's tank for 20 bucks! Hit the road again. Have sentimental feelings upon arriving in Frankfort. Get home. Get mail. Wish David was here. Leave freezing kid outside back door without coat while running around to unlock the front door. Open box of our Christmas Cards and inspect. Chill out awhile. Let girls practice by themselves for a combined total of about 4 minutes and let them get a practice prize anyway (who cares). Help Karissa find ballet clothes. Admire Kayla's horse drawing. Marvel at the Christmas explosion in our house. Unload van. Wish David was home. Move dogs from kennel to basement. Feed & water dogs. Put in load of laundry. Unload van. Wish David was home. Plug in charger to phone. Get distracted and lose phone. Unload van. Decide to do once a month cooking again soon so the freezer will be stocked with meals. Wish David was home. Think about how organized I'm going to get in the next couple of weeks at home. Find phone in a weird place. Plug in phone. Sigh at the Christmas explosion in small house. Whip up a gourmet double batch of Mac & Cheese. Calm a sibling fight involviving water gun, sharp scissors, and a large roll of duct tape. Super Yummy for the pregnanty tummy on the Mac & Cheese. Stop little boy from pouring grape juice into mac & cheese. Unplug phone to call David. Set down phone at the sound of deep purple grape juice gushing from table to floor. Clean up grape juice. Make note to buy Viva Paper towells again (AMAZINGLY absorbant!). Groan inside when naked boy runs to kitchen and announces "I poo-poo!" and inspects his own hands. Ask him to show me where. Groan to see the training potty has already been emptied and ask where again. Sigh to see that contents have been (almost) successfully emptied into big potty. Rinse training potty and grin as naked boy does an adorable little bottom jig and sings "I poo-POO! I poo-POO!" Sit down alone to finish mac & cheese. Dream about a long quiet bubble bath after kids are in bed. Call David. Write obnoxious blog post. Click the picture to see more of Maria's pictures. She's gorgeous! We had a lot of fun freezing our frannies today.